Today women use eyeliner, eye shadow and mascara, but we’ll never be absolutely sure what ancient women used to paint their eyes. Imagining ancient advertising campaigns for mascara makes me chuckle – I can’t quite imagine the women having a product that lifts, separates, and adds volume to their eyelashes. Recently, the Environmental Working Group ranked 613 different mascara products for safety. And unlike the surprising safety of eyeliners, there are many toxic varieties of mascara on store shelves. In fact, 24 different types have been rated as high health hazards. So what are the dangerous ingredients in these toxic tubes of mascara? The common offender is one or more parabens used in a single product – including propylparaben, butylparaben, and isobutylparaben. Parabens accumulate in breast tumors and are toxic to your developmental and reproductive systems. Retinyl (vitamin A) acetate is toxic to your reproductive system and organs. Banned from cosmetics in the European Union, BHA disrupts the endocrine system, is a known human toxicant, and aggravates allergies. BHA is found in Rimmel Lash Accelerator Mascara and Love My Eyes Mascara. Classified as toxic or harmful in both the European Union and Canada, morpholine is believed to be a human skin toxicant. Morpholine is found in Love My Eyes Mascara. As the worst toxin in mascara, thimerosal is a derivative of mercury. (You may remember it as the toxin so debated in vaccines.) In case you’re not sure about the dangers of thimerosal, it’s a known human nervous system toxicant; its use is restricted in cosmetics in both the U.S. and Canada; it’s an environmental toxin; and there’s limited evidence that it’s toxic to your blood, cardiovascular system, endocrine system, gastrointestinal system, immune system, kidneys, liver, reproductive system, and respiratory system. Thimerosal is found in Love My Eyes Mascara. 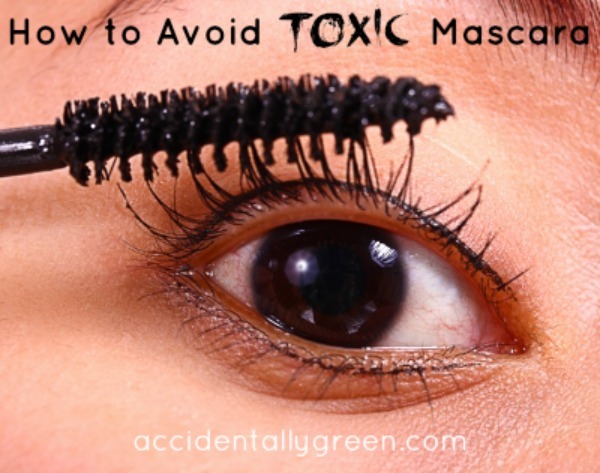 To know if you’re shopping for a safe or toxic mascara, though, you need to check out the safety ranking first. Mine is #20 on the list – Organic Wear Black from Physicians Formula. A few months ago I couldn’t find my usual at the store where I went and settled for getting my old Maybelline brand (which isn’t even that bad, it was rated as a moderate 4). I immediately started to get eye twitches which a nurse friend recognized as a reaction to my mascara. The next time I went to the city I stocked up on my Organic stuff and as soon as I switched back the problem went away.